With over 70 years in the automotive industry, Wyatt Johnson is proud to be one of the premier dealerships in Middle Tennessee. The modern facilities are well maintained, functional and efficient to help customers and employees feel comfortable. Wyatt Johnson contributes a significant amount of time, energy and capital into the local community – focusing on economic development and education. We've been named to the Nashville Business Journal’s Fastest Growing Company List for 5 years running and we've won the Philanthropic Impact Award, Clarksville-Montgomery County Growth & Impact Program and we've been recognized in the Top 5 of Women Owned Businesses by Nashville Business Journal. We offer ongoing product and ASE training, a fantastic culture and career advancement opportunities; all of which will help you grow at Wyatt Johnson Auto Group! If you'd like to join us, please take a look at our open positions on the Careers page and apply today! Family Medical, Dental and Vision plans are available, as well as employer paid Life Insurance. We offer a 401k with company match to all full-time employees. 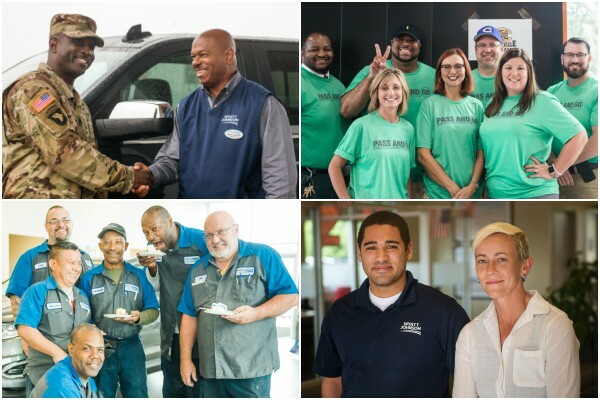 We have 5 dealerships and you'll have access to work at any of them! We provide discounted gym memberships so our employees can maintain a healthy lifestyle! We recognize 5 company holidays and we offer additional Paid Time Off. At Wyatt Johnson Auto Group, we strive to be much more than a business. We are partners with our community and as an employee, you will get a chance to give back as well. We partner with many local organizations, charities and events with the goal of supporting our local community and the less fortunate. We host 'Pass and Go', an annual Clarksville-Montgomery School System Program. This event celebrates high school students that pass their Advanced Placement class exams. One student is awarded a new car! Ready to join the best dealership group in the country?